Платформы X10/X20 предназначены для вещателей, работающих на рынке “video contribution market”. X10/X20 оснащены интерфейсами 10G и способны принимать и передавать через IP-сети огромные объемы видео-трафика - до 80/140 Гбит/с. Энкодирование и декодирование H264/HEVC с параметрами 10 бит/4:2:2 c разрешением до 4K. Поддерживаются режимы ультранизкой задержки компрессии и декодирования. Новейшие технологии компрессии видео без потерь - JPEG2000 и TICO. Высокотехнологичная передача несжатого HD/UHD видео в IP сети - SDI over IP. Новый модуль скремблера поддерживает защиту до 2000 сервисов. Ряд модулей поддерживают до 2000 потоков/сервисов по входу и выходу и 10G трафика. Резервирование потоков для защиты от потери данных в IP сети Seamless Input Redundancy (бесшовная склейка из 2-х потоков по входу). Модуль Switch + Control with 1xIP In and 1xIP out, RJ45, No Multiplexing, No FEC, No IP Out Red. Модуль Switch + Control with 1xIP In and 1xIP out, RJ45, No Multiplexing, FEC In, No IP Out Red. Модуль Switch + Control with 1xIP In and 1xIP out, RJ45, No Multiplexing, FEC Out, No IP Out Red. Модуль Switch + Control with 1xIP In and 1xIP out, RJ45, No Multiplexing, FEC In/Out, No IP Out Red. Модуль Switch + Control with 1xIP In and 1xIP out, RJ45, Multiplexing, No FEC, No IP Out Red. Модуль Switch + Control with 1xIP In and 1xIP out, RJ45, Multiplexing, FEC In, No IP Out Red. Модуль Switch + Control with 1xIP In and 1xIP out, RJ45, Multiplexing, FEC Out, No IP Out Red. Модуль Switch + Control with 1xIP In and 1xIP out, RJ45, Multiplexing, FEC In/Out, No IP Out Red. Модуль Switch + Control with 1xIP In and 1xIP out, RJ45, No Multiplexing, No FEC, IP Out Red. Модуль Switch + Control with 1xIP In and 1xIP out, RJ45, No Multiplexing, FEC In, IP Out Red. Модуль Switch + Control with 1xIP In and 1xIP out, RJ45, No Multiplexing, FEC Out, IP Out Red. Модуль Switch + Control with 1xIP In and 1xIP out, RJ45, No Multiplexing, FEC In/Out, IP Out Red. Модуль Switch + Control with 1xIP In and 1xIP out, RJ45, Multiplexing, No FEC, IP Out Red. Модуль Switch + Control with 1xIP In and 1xIP out, RJ45, Multiplexing, FEC In, IP Out Red. Модуль Switch + Control with 1xIP In and 1xIP out, RJ45, Multiplexing, FEC Out, IP Out Red. Модуль Switch + Control with 1xIP In and 1xIP out, RJ45, Multiplexing, FEC In/Out, IP Out Red. Модуль Switch + Control with 2xIP Out, RJ45, No Multiplexing, No FEC, No IP Out Red. Модуль Switch + Control with 2xIP Out, RJ45, No Multiplexing, FEC Out, No IP Out Red. Модуль Switch + Control with 2xIP Out, RJ45, Multiplexing, No FEC, No IP Out Red. Модуль Switch + Control with 2xIP Out, RJ45, Multiplexing, FEC Out, No IP Out Red. Модуль Switch + Control with 2xIP Out, RJ45, No Multiplexing, No FEC, IP Out Red. Модуль Switch + Control with 2xIP Out, RJ45, No Multiplexing, FEC Out, IP Out Red. Модуль Switch + Control with 2xIP Out, RJ45, Multiplexing, No FEC, IP Out Red. Модуль Switch + Control with 2xIP Out, RJ45, Multiplexing, FEC Out, IP Out Red. Модуль Switch + Control with Cloned IP Out, RJ45, No Multiplexing, No FEC, No IP Out Red. Модуль Switch + Control with Cloned IP Out, RJ45, No Multiplexing, FEC Out, No IP Out Red. Модуль Switch + Control with Cloned IP Out, RJ45, Multiplexing, No FEC, No IP Out Red. Модуль Switch + Control with Cloned IP Out, RJ45, Multiplexing, FEC Out, No IP Out Red. Модуль Switch + Control with Cloned IP Out, RJ45, No Multiplexing, No FEC, IP Out Red. Модуль Switch + Control with Cloned IP Out, RJ45, No Multiplexing, FEC Out, IP Out Red. Модуль Switch + Control with Cloned IP Out, RJ45, Multiplexing, No FEC, IP Out Red. Модуль Switch + Control with Cloned IP Out, RJ45, Multiplexing, FEC Out, IP Out Red. Модуль Switch + Control with 1xIP In and 1xIP out, SFP, No Multiplexing, No FEC, No IP Out Red. Модуль Switch + Control with 1xIP In and 1xIP out, SFP, No Multiplexing, FEC In, No IP Out Red. Модуль Switch + Control with 1xIP In and 1xIP out, SFP, No Multiplexing, FEC Out, No IP Out Red. Модуль Switch + Control with 1xIP In and 1xIP out, SFP, No Multiplexing, FEC In/Out, No IP Out Red. Модуль Switch + Control with 1xIP In and 1xIP out, SFP, Multiplexing, No FEC, No IP Out Red. Модуль Switch + Control with 1xIP In and 1xIP out, SFP, Multiplexing, FEC In, No IP Out Red. Модуль Switch + Control with 1xIP In and 1xIP out, SFP, Multiplexing, FEC Out, No IP Out Red. Модуль Switch + Control with 1xIP In and 1xIP out, SFP, Multiplexing, FEC In/Out, No IP Out Red. Модуль Switch + Control with 1xIP In and 1xIP out, SFP, No Multiplexing, No FEC, IP Out Red. Модуль Switch + Control with 1xIP In and 1xIP out, SFP, No Multiplexing, FEC In, IP Out Red. Модуль Switch + Control with 1xIP In and 1xIP out, SFP, No Multiplexing, FEC Out, IP Out Red. Модуль Switch + Control with 1xIP In and 1xIP out, SFP, No Multiplexing, FEC In/Out, IP Out Red. Модуль Switch + Control with 1xIP In and 1xIP out, SFP, Multiplexing, No FEC, IP Out Red. Модуль Switch + Control with 1xIP In and 1xIP out, SFP, Multiplexing, FEC In, IP Out Red. Модуль Switch + Control with 1xIP In and 1xIP out, SFP, Multiplexing, FEC Out, IP Out Red. Модуль Switch + Control with 1xIP In and 1xIP out, SFP, Multiplexing, FEC In/Out, IP Out Red. Модуль Switch + Control with 2xIP Out, SFP, No Multiplexing, No FEC, No IP Out Red. Модуль Switch + Control with 2xIP Out, SFP, No Multiplexing, FEC Out, No IP Out Red. Модуль Switch + Control with 2xIP Out, SFP, Multiplexing, No FEC, No IP Out Red. Модуль Switch + Control with 2xIP Out, SFP, Multiplexing, FEC Out, No IP Out Red. Модуль Switch + Control with 2xIP Out, SFP, No Multiplexing, No FEC, IP Out Red. Модуль Switch + Control with 2xIP Out, SFP, No Multiplexing, FEC Out, IP Out Red. Модуль Switch + Control with 2xIP Out, SFP, Multiplexing, No FEC, IP Out Red. Модуль Switch + Control with 2xIP Out, SFP, Multiplexing, FEC Out, IP Out Red. Модуль Switch + Control with Cloned IP Out, SFP, No Multiplexing, No FEC, No IP Out Red. Модуль Switch + Control with Cloned IP Out, SFP, No Multiplexing, FEC Out, No IP Out Red. Модуль Switch + Control with Cloned IP Out, SFP, Multiplexing, No FEC, No IP Out Red. Модуль Switch + Control with Cloned IP Out, SFP, Multiplexing, FEC Out, No IP Out Red. Модуль Switch + Control with Cloned IP Out, SFP, No Multiplexing, No FEC, IP Out Red. Модуль Switch + Control with Cloned IP Out, SFP, No Multiplexing, FEC Out, IP Out Red. Модуль Switch + Control with Cloned IP Out, SFP, Multiplexing, No FEC, IP Out Red. Модуль Switch + Control with Cloned IP Out, SFP, Multiplexing, FEC Out, IP Out Red. IP Out Red - резервирование по IP выходу. Модуль Dual IP IO, 1xIP In and 1xIP Out, No Multiplexing, No FEC, No IP Out Red. Модуль Dual IP IO, 1xIP In and 1xIP Out, No Multiplexing, FEC In, No IP Out Red. Модуль Dual IP IO, 1xIP In and 1xIP Out, No Multiplexing, FEC Out, No IP Out Red. Модуль Dual IP IO, 1xIP In and 1xIP Out, No Multiplexing, FEC In/Out, No IP Out Red. Модуль Dual IP IO, 1xIP In and 1xIP Out, Multiplexing, No FEC, No IP Out Red. Модуль Dual IP IO, 1xIP In and 1xIP Out, Multiplexing, FEC In, No IP Out Red. Модуль Dual IP IO, 1xIP In and 1xIP Out, Multiplexing, FEC Out, No IP Out Red. Модуль Dual IP IO, 1xIP In and 1xIP Out, Multiplexing, FEC In/Out, No IP Out Red. Модуль Dual IP IO, 1xIP In and 1xIP Out, No Multiplexing, No FEC, IP Out Red. Модуль Dual IP IO, 1xIP In and 1xIP Out, No Multiplexing, FEC In, IP Out Red. Модуль Dual IP IO, 1xIP In and 1xIP Out, No Multiplexing, FEC Out, IP Out Red. Модуль Dual IP IO, 1xIP In and 1xIP Out, No Multiplexing, FEC In/Out, IP Out Red. Модуль Dual IP IO, 1xIP In and 1xIP Out, Multiplexing, No FEC, IP Out Red. Модуль Dual IP IO, 1xIP In and 1xIP Out, Multiplexing, FEC In, IP Out Red. Модуль Dual IP IO, 1xIP In and 1xIP Out, Multiplexing, FEC Out, IP Out Red. Модуль Dual IP IO, 1xIP In and 1xIP Out, Multiplexing, FEC In/Out, IP Out Red. Модуль 4 DVB-S/S2X input. DVB-S, NoT2MI De-encap. Модуль 4 DVB-S/S2X input. DVB-S/S2, NoT2MI De-encap. Модуль 4 DVB-S/S2X input. DVB-S/S2/S2X. NoT2MI De-encap. Модуль 4 DVB-S/S2X input. DVB-S. T2MI De-encap. Модуль 4 DVB-S/S2X input. DVB-S/S2, T2MI De-encap. Модуль 4 DVB-S/S2X input. DVB-S/S2/S2X, T2MI De-encap. Модуль Encoder, Composite video/Analouge audio input (no HD suport), 2 SD ch. Модуль Encoder, Composite video/Analouge audio input (no HD suport), 4 SD ch. Новинка Модуль Universal Dense Broadcast Transcoder Транскодирует до 16 SD или до 4 HD каналов MPEG-2/4 в любом направлении, генерация PiP, 1 слот шириной. Рекомендуется для DVB-C и IPTV Конвертация форматов аудио, up и down конверсия между HD и SD, frame rate конверсия, вставка логотипа и статистическое мультиплексирование (опции). Новинка Модуль Universal High Video Quality Broadcast Transcoder Транскодирует до 2 SD или 1 HD каналов MPEG-2/4 в любом направлении + PiP, 1 слот шириной. Транскодер профессионального вещательного класса для предельной минимизации полосы транспондера с минимум видео-артефактов для DVB-S/S2/S2X и DVB-T/T2 вещания. Конвертация форматов аудио, up и down конверсия между HD и SD, frame rate конверсия, вставка логотипа и статистическое мультиплексирование (опции). Новинка Модуль Universal MultiScreen (OTT) Encoder 4xSDI или 2xHDSDI входа, энкодирует до 4х видео-сервисов в выходные видео-профили от 720p 60/50 Hz до 144p 15/12,5 Hz, на выходе от 4 HD профилей до 28 subSD профилей низкого разрешения. 1 слот шириной. Новинка Модуль Universal High Video Quality Broadcast Encoder 2xHDSDI входа, энкодирует до 2 SD или 1 HD каналов MPEG-2/4 в любом направлении + PiP, 1 слот шириной. Энкодер профессионального вещательного класса для предельной минимизации полосы транспондера с минимум видео-артефактов для DVB-S/S2/S2X и DVB-T/T2 вещания. Настраиваемые режимы компрессии, пред-процессинг, управления GoP. Статистическое мультиплексирование и вставка логотипа (опции). Функции и режимы для профессионального броадкастинга. Модуль Dual IP IO, Cloned IP Out, No Multiplexing, No FEC, No IP Out Red. Модуль Dual IP IO, Cloned IP Out, Multiplexing, No FEC, No IP Out Red. Модуль Dual IP IO, Cloned IP Out, No Multiplexing, FEC Out, No IP Out Red. Модуль Dual IP IO, Cloned IP Out, Multiplexing, FEC Out, No IP Out Red. Модуль Dual IP IO, Cloned IP Out, No Multiplexing, No FEC, IP Out Red. Модуль Dual IP IO, Cloned IP Out, Multiplexing, No FEC, IP Out Red. Модуль Dual IP IO, Cloned IP Out, No Multiplexing, FEC Out, IP Out Red. Модуль Dual IP IO, Cloned IP Out, Multiplexing, FEC Out, IP Out Red. Encoder/Transcoder statmux license, 1 ch. Encoder/Transcoder statmux license, 2 ch. Encoder/Transcoder statmux license, 3 ch. Encoder/Transcoder statmux license, 4 ch. Прием DVB-S/S2, декодирование MPEG-2/4, HD/SD. Порты: SAT, HDMI, composite video, AES/EBU аудио, 2+2 стерео пары аналог. аудио - 4 x RCA (небаланс.) + 4 XLR (балансное аудио). Управление WEB GUI (RJ45). Прием DVB-S/S2, 2xCI, MSD, декодирование MPEG-2/4, HD/SD. Порты: SAT, ASI-in, ASI-out, HDMI, composite video, AES/EBU аудио, 2+2 стерео пары аналог. аудио - 4 x RCA (небаланс.) + 4 XLR (балансное аудио). Управление WEB GUI (RJ45). Прием DVB-С, 2xCI, MSD, декодирование MPEG-2/4, HD/SD. Порты: SAT, ASI-in, ASI-out, HDMI, composite video, AES/EBU аудио, 2+2 стерео пары аналог. аудио - 4 x RCA (небаланс.) + 4 x XLR (балансное аудио). Управление WEB GUI (RJ45). Прием DVB-T2, 2xCI, MSD, декодирование MPEG-2/4, HD/SD. Порты: SAT, ASI-in, ASI-out, HDMI, composite video, AES/EBU аудио, 2+2 стерео пары аналог. аудио - 4 x RCA (небаланс.) + 4 XLR (балансное аудио). Управление WEB GUI (RJ45). Прием DVB-S/S2, 2xCI, MSD, декодирование MPEG-2/4, HD/SD. Порты: SAT, ASI-in, ASI-out, HDMI, 2 x SDI (SD/HD), composite video, SDI-embedded аудио (2), AES/EBU аудио, 2+2 стерео пары аналог. аудио - 4 x RCA (небаланс.) + 4 x XLR (балансное аудио). Управление WEB GUI (RJ45). Прием DVB-S/S2 multistream, 2xCI, MSD, декодирование MPEG-2/4, HD/SD. Порты: SAT, ASI-in, ASI-out, HDMI, 2 x SDI (SD/HD), composite video, SDI-embedded аудио (2), AES/EBU аудио, 2+2 стерео пары аналог. аудио - 4 x RCA (небаланс.) + 4 x XLR (балансное аудио). Управление WEB GUI (RJ45). Прием DVB-T2, 2xCI, MSD, декодирование MPEG-2/4, HD/SD. Порты: SAT, ASI-in, ASI-out, HDMI, 2 x SDI (SD/HD), composite video, SDI-embedded аудио (2), AES/EBU аудио, 2+2 стерео пары аналог. аудио - 4 x RCA (небаланс.) + 4 x XLR (балансное аудио). Управление WEB GUI (RJ45). Прием DVB-S/S2, 2xCI, MSD, декодирование MPEG-2/4, HD/SD. Порты: SAT, ASI-in, ASI-out, HDMI, SDI (SD/HD), composite video, SDI-embedded аудио, AES/EBU аудио, 2+2 стерео пары аналог. аудио - 4 x RCA (небаланс.) + DB15 (балансное аудио), IP-in/1xTS-IP-in (1 x RJ45), IP-out/8 TS-IP-out) (1 x RJ45). Управление WEB GUI (RJ45). Dual тюнер DVB-S/S2, 2xCI, MSD, декодирование MPEG-2/4, HD/SD. Embedded BISS-1/1E, поддержка TS/Service level descrambling. Порты: 2 x SAT, 2 x ASI-in, 2 x ASI-out, HDMI, SDI (SD/HD), composite video, SDI-embedded аудио, AES/EBU аудио, 2+2 стерео пары аналог. аудио - 4 x RCA (небаланс.) + DB15 (балансное аудио), IP-in/2xTS-IP-in (1 x RJ45), IP-out/2 TS-IP-out (1 x RJ45). Управление WEB GUI (RJ45). Dual тюнер DVB-S/S2, 2xCI, MSD, декодирование MPEG-2/4, HD/SD. Порты: 2 x SAT, 2 x ASI-in, 2 x ASI-out, HDMI, SDI (SD/HD), composite video, SDI-embedded аудио, AES/EBU аудио, 2+2 стерео пары аналог. аудио - 4 x RCA (небаланс.) + DB15 (балансное аудио), IP-in/2xTS-IP-in (1 x RJ45), IP-out/2x TS-IP-out (1 x RJ45), 1RF-out (4 x QAM/2 x OFDM несущих). Встроенный мультиплексор, встроенный QAM/OFDM модулятор. Управление WEB GUI (RJ45). Транскодер MPEG-4/2 to MPEG-2 (4 программы). 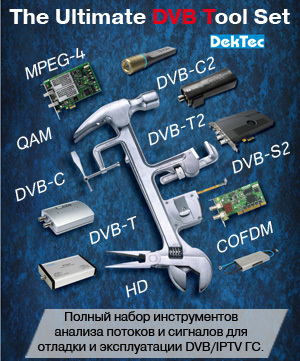 Тюнер DVB-S/S2, 2xCI, MSD, декодирование MPEG-2/4, HD/SD. Порты: SAT, ASI-in, ASI-out, HDMI, SDI (SD/HD), composite video, SDI-embedded аудио, AES/EBU аудио, 2+2 стерео пары аналог. аудио - 4 x RCA (небаланс.) + DB15 (балансное аудио), IP-in/1xTS-IP-in (1 x RJ45), IP-out/8x TS-IP-out (1 x RJ45). Управление WEB GUI (RJ45). Транскодер MPEG-2/4 to MPEG-4 (4 программы). Тюнер DVB-S/S2, 2xCI, MSD, декодирование MPEG-2/4, HD/SD. Порты: SAT, ASI-in, ASI-out, HDMI, SDI (SD/HD), composite video, SDI-embedded аудио, AES/EBU аудио, 2+2 стерео пары аналог. аудио - 4 x RCA (небаланс.) + DB15 (балансное аудио), IP-in/1xTS-IP-in (1 x RJ45), IP-out/8x TS-IP-out (1 x RJ45). Управление WEB GUI (RJ45).